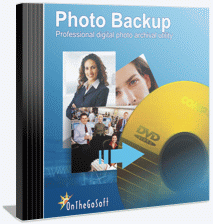 Photo Backup creates a robust archive for your digital photos on DVDs or CDs. It's especially designed to handle large numbers of photos, spanning many DVDs. If you take one or two pictures, once in a while, then you're probably happy with the software that came free with your digital camera. However, if you've got thousands of digital photos, then Photo Backup is going to make it much easier to protect them. Multi-session backup to any type of CD or DVD. Search the archive even if photos are no longer on hard drive. Selectively retrieve photo from the archive. Maintain independent archives for different photo collections. Bullet proof archive management - never lose data. We understand that you have your own way of doing things. Photo Backup doesn't force you into doing things it's way. Instead, it gives you the tools to manage your digital photo archive like you prefer. No matter which program you use to edit and organize photos. Photo Backup creates a complete, full and up-to-date archive, and makes it extremely easy to retrieve photos when you need them. You can even create and manage different archives with Photo Backup - to keep different collections on different discs. Create a complete archive. Keep it fresh at all times. Look for photos according to date, folder or disc. Retrieve only the photos you need, when you need them. Photo Backup will search your hard drive looking for folders that contain photos. On the first time you use Photo Backup, it will scan the entire hard drive. Next times, it only looks for new photos that need backup. Photo Backup will tell you how many discs are needed to complete the backup. It knows what's been archived already, and will only burn new or modified files. When you need to retrieve photos from the archive, you'll discover the true power of Photo Backup. You'll be able to efficiently search through thousands of photos and select the ones you need. Photo Backup will then retrieve them. Download a fully functional 14 days free trial and see if fits your needs. You don't need to register in order to use it, and backup that you create with the trial version is usable even if you don't decide to purchase. If you have any questions or need assistance, contact us and we'll be glad to help.